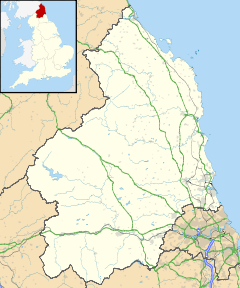 Bellingham (/ˈbɛlɪndʒəm/ BEL-in-jəm) is a village in Northumberland, to the north-west of Newcastle upon Tyne and is situated on the Hareshaw Burn at its confluence with the River North Tyne. Famous as a stopping point on the Pennine Way trail it is popular with walkers and cyclists. Nearby is the Hareshaw Linn, a waterfall and the site of early coke blast furnaces. The village's local newspaper is the Hexham Courant. There is also an 18-hole golf course which was established in 1893. The Heritage Centre is the local museum. It has exhibitions on the Border Counties Railway, the Border reivers, mining, farming, the photography of W P Collier, and the Stannersburn Smithy. It has a database of local family names and one of old photographs. It also holds special exhibitions of historical or artistic interest, and readings and performances by poets, storytellers, musicians and dancers. The Grade-I listed St Cuthbert's Church (13th-century, substantially reconstructed in the early 17th century) is described as 'almost unique in England' owing to its stone barrel vault, which runs the length of the nave and extends into the south transept. Three miracles in Bellingham connected with the mediaeval cult of St Cuthbert are recorded in the twelfth-century Libellus of Reginald of Durham. Within the churchyard on the north side is "The Long Pack", purportedly the grave of a burglar who attempted to infiltrate a local house by hiding in a beggar's pack, but was discovered after he suffered an ill-timed coughing fit, and was promptly run through with the sword of the house's proprietor. Adjacent to the church is St Cuthbert's Well, known locally as "Cuddy's Well", an ancient holy well. The well is in the middle of a grassy path leading down to the river, on the other side of the churchyard wall. From 1735 the parish rectors at Bellingham were under the patronage of the Governors of Greenwich Hospital. The Governors stipulated that the rectors were to be graduates of Oxford or Cambridge, and naval chaplains. Bellingham Rectory was one of six such rectories in the Simonburn area, the others being Falstone, Greystead, Thorneyburn, Wark on Tyne and Simonburn. The village football team competes in the Tyneside Amateur League First Division. Bellingham Bridge is a Grade II listed building built in 1834. It crosses the North Tyne. Two miles north-east at Hole Farm is the sixteenth century Grade II* listed building, Hole Bastle, a well-preserved example of a bastle house. Shitlington Crags is a crag near Shitlington Hall, south of Bellingham. The crag is at an average altitude of 170 metres. The Pennine Way passes by the crag. Sir David Lindsay Keir, the historian and academic, was born and raised here. An electoral ward in the same name exists. This ward stretches north to the Scottish Border with a total population of 4,074. ^ "Parish population 2011". Retrieved 26 June 2015. ^ Historic England. "Details from image database (239423)". Images of England. Retrieved 22 March 2017. ^ "Little Book of Miracles of the Blessed Cuthbert Performed in Recent Times"
^ Historic England. "Details from image database (239427)". Images of England. Retrieved 22 March 2017. ^ Information in Bellingham Parish Church visited 2013. ^ Historic England. "Details from image database (239386)". Images of England. Retrieved 22 March 2017. ^ "North Tyne - Bellingham Bridge". Bridges on the Tyne. Retrieved 15 January 2017. ^ Historic England. "Details from image database (239410)". Images of England. Retrieved 22 March 2017. ^ "Ward population 2011". Retrieved 26 June 2015. Wikimedia Commons has media related to Bellingham, Northumberland. This page was last edited on 20 June 2018, at 14:20 (UTC).